William & Mary prides itself on its many traditions, among them Opening Convocation, Yule Log and Charter Day. But it is also a university in flux, with fresh ideas and programs, new facilities and high energy. Here’s a sampling of some of the new things being implemented this academic year. The first full year of on-campus COLL 300 courses is in place. The 2016 themes are Well-being (in fall) and Unrest (in spring) with a full slate of faculty-proposed supporting visitors. Steve Shellman, the principal investigator for the Violent Intranational Political Conflict & Terrorism (VIPCAT) lab since 2008, will teach courses within the COLL curriculum focused on data science, Big Data, and automated text analysis tools and methods which highlight VIPCAT's capabilities. Through these courses, students will acquire skills necessary to conduct policy-relevant research. In addition, significant work with the Education Policy Committee (EPC) and faculty is continuing to coordinate the framework for COLL 400 courses, the culminating experience in students’ majors. The university has established a new interdisciplinary program for Asian and Pacific Islander American (APIA) studies, with students pursuing a minor in the discipline this fall. Work continues on the James A. and Robin L. Hixon Center for Experiential Learning and Leadership, a 12,000-square foot building at William & Mary Law School. All nine of the law school’s clinics will be located on the first floor, which will feature offices for managing attorneys to meet individually with students enrolled in the clinics, client interview rooms, and a multipurpose conference room/clinical classroom. The Legal Practice Program and the school’s leadership activities will be located on the second floor. It is tentatively scheduled to open winter 2017. Tyler Hall was opened in 1927 and last upgraded in 1980 – until now, when what was essentially a full-gut renovation was undertaken. What once was a wall of dark paneling behind which stood an auditorium has been replaced by an open space stretching two stories, with smaller classrooms and seminar rooms throughout the first and second floors. The third and fourth floors primarily house faculty offices for public policy, government, economics and international relations departments. The building is now is use. Walter J. Zable Stadium’s capacity will remain approximately the same as before at 12,000, but 10 luxury boxes were built as well as a new press box, concession and bathroom areas and circulation space as part of its recent renovation. The multi-level space added about 90,000 square feet to the project. The old bathrooms on the northwest side were removed, replaced by the original arcade configuration. Some of the bathrooms on the east side were renovated. An elevator and a large staircase are in place to transport fans to various seating areas. The stadium is expected to be ready for the Tribe’s opening home game on Sept. 17. An open house is scheduled for Sept. 4. The third phase of the recently opened Integrated Science Center measures 113,000 square feet. It has a four-story core that has been called by Eric Bradley, chair of the Department of Biology and emergency and planning coordinator for Arts & Sciences “the machine of science.” Offices and labs in biology that remained in Millington Hall when ISC 1 and 2 came on line in 2008 have moved to ISC 3.The organization of ISC 3 focuses on the interdisciplinary such as neuroscience and environmental sciences. The labs are built on a 10-foot, 6-inch grid which allows for reconfiguration. As faculty members move through the program, or as they go to another institution, the labs can be re-adapted to the next professor or for different activities. Work continues on a 300-seat auditorium, expected to be ready around Sept. 7. 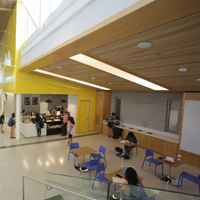 William & Mary Dining will open Element Café in ISC3 which will offer soups, sandwiches and other treats. The start of a comprehensive renovation of Landrum Hall dormitory. Start date is estimated to be May 2017 and is expected to last until July of the following year. The construction of the McLeod Tyler Wellness Center, no later than this spring. The center will be located behind the Sadler Center, where the lodges [excluding The Daily Grind] previously stood. The building will house the Student Health Center, the Counseling Center, Health Promotion and the wellness components of Campus Recreation. The building will also house a new Center for Mindfulness and Authentic Excellence. The goal is to have it completed in 2018. The laying of new field turf on the recreation field adjacent to Busch Field this fall. Currently natural grass, the field cannot be used for recreation activities following inclement weather. Installing field [artificial] turf will enable students involved in recreation activities to use it all year round. 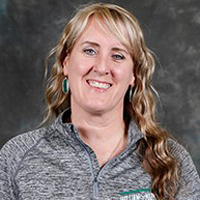 Two new head coaches have joined the department of athletics. They are Alex Heacock, director of track and field, and Melissa Ferris, women's volleyball. W&M Libraries is launching a new catalog that will improve how materials are browsed, searched and discovered. This next-generation system, Alma/Primo, has been implemented by many libraries across the nation and in Virginia. Alma/Primo will integrate the library’s multiple back-end systems and three separate public catalogs into a single search platform for accessing millions of library holdings. Its user-friendly interface will make databases and websites easier to navigate and research content more discoverable. Other features include responsive design optimized for smartphones and tablets, options for advanced search and integration into the interlibrary loan system. W&M Dining has added a new salad bar, hot entrée and grill equipment to Marketplace to offer more choices. 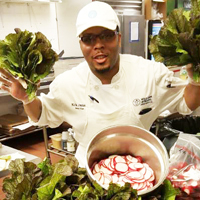 In addition, it has formed a partnership with KelRae Farms in Toano, Virginia, a family-owned farm, in order to provide the freshest and healthiest ingredients to students. Both parties will agree on which crops to plant, based on the season. Student sustainability interns and American Culinary Foundation apprentices will work on the farm. The plants are harvested, transported to campus, prepped and then go straight to the student’s plate. This semester, the following fresh items will be served: broccoli, cucumbers/pickling cucumbers, a variety of lettuce, a variety of kale, green cabbage, late tomatoes, collard plants and possibly some kohlrabi, turnips and carrots. Accounts can be managed online. The online portal allows customers to purchase decals online, manage vehicle and address information, file appeals or pay citations. 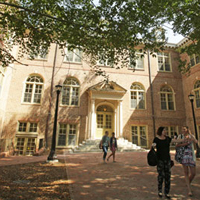 The William & Mary Bookstore has implemented a textbook Price Match Program with bn.com and Amazon.com. See store for details. Last spring, the bookstore launched The Glossary, which offers premium cosmetic brands such as Smashbox, Butter London, Philosophy and Lipstick Queen, as well as CoverGirl, Burt’s Bees and Maybelline New York. Finally, the Bookstore has been named an “Authorized Campus Store” for Apple products. Details coming soon. W&M Conference and Event Services has assumed management for external events at the Martha Wren Briggs Amphitheatre at Lake Matoaka. The venue will host the Virginia Symphony “Under the Stars” on Sept. 1 and Canaan Smith on Oct. 23.